IF YOU WERE FORCED TO PICK ONLY ONE PLACE TO VISIT in Botswana, you’d do well to choose this one. 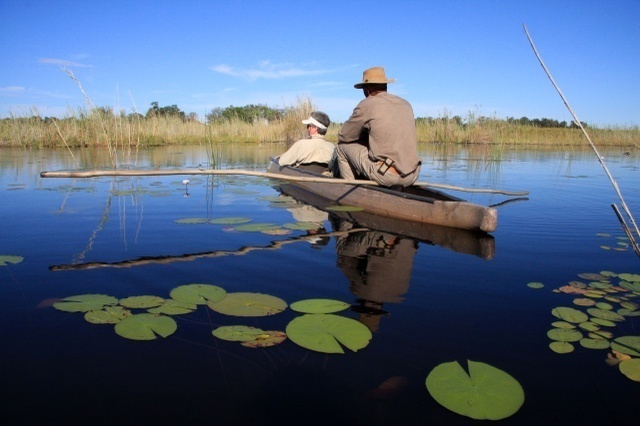 Located in the north of the country, you’ll spot the Okavango Delta as a pale blue hand on the map, its fingers reaching south towards Maun. The delta is known as the jewel of the Kalahari and for good reason - it’s the site of a natural phenomenon of almost unimaginable scale and wonder. In the very depths of the dry season the Okavango Delta floods, spreading out to cover an area close to 15 000 km2 - almost double its normal size. The flood cycle begins every year with summer rains which fall in the Angolan highlands far to the north; here, smaller tributaries combine to become the Cuito river which in turn is fed by the Cubango river. Over the course of a month, the swollen waters of the Okavango river flow more than a thousand kilometres through the Kalahari, across the Kavango region, until their course is halted by a tectonic trough, and some 11 cubic kilometres of waters soak into the delta. This annual flooding revitalises the area, attracting an indescribable amount of wildlife. It’s a process which has kept the delta uninhabitable for the most part, so a visit here is to see the land as it’s been for thousands of years, untouched and unspoilt. To properly explore you’ll want to park the 4x4 and climb into a mokoro – a canoe made from a hollowed-out tree trunk (or the modern fibreglass equivalent). With a knowledgeable guide standing in the stern, pushing forwards with a pole, you will experience the delta’s clear waters, floating islands and winding, papyrus-lined waterways up close and quiet. Of course, a flight over the delta is also unforgettable, if only just to give you a sense of size and wonder. Birdwatchers will want to book a few days here as the delta is home to more than 400 species, including the rare Pel’s fishing owl. If larger mammals are your thing, you’ll want to look out for the lechwe antelope, an animal uniquely adapted for living in watery conditions. Maun, Botswana’s tourist capital, is located to the south of the delta. Here, you’ll be able to make all the necessary travel arrangements as well choose from a broad range of accommodation. On the eastern side of the Okavango Delta, you’ll find Moremi Game Reserve, named after Chief Moremi of the Batawana tribe. This was the first wildlife sanctuary to be created by an African tribe within their own area. The bulk of the 5 000 km2 park falls in the delta with only around a third being a mainland, including a dry peninsula called the Mopane tongue. There are also densely-wooded areas where you might spot wild dog or leopard. The reserve boasts a variety of wildlife that moves freely (even through campsites) and is a real paradise for bird lovers. You need a 4WD to tour Moremi as you have to negotiate deep sand in summer, and mud or water crossings when the delta floods in winter. Note, the following activities are prohibited in the reserve: off-road driving, night drives, walking safaris and fishing. Moremi’s main entrance, Khwai North Gate, or North Gate as the locals call it, is situated on the Khwai River. A large number of San (Bushmen) call the Khwai Village their home after being relocated from the reserve area. The Khwai Development Trust Concession Area just to the north of Moremi Game Reserve offers the ideal stopover en-route between Moremi and Savuti in the Chobe National Park. There are a number of Community Trusts in this region, like the Khwai Development Trust. These conservation areas are run by the local communities who also support eco-tourism. As the proceeds go to the local communities and it creates job opportunities, we urge you to support them. Apart from Moremi and the Community Trust conservation areas, Botswana’s wildlife can also be enjoyed at the private concession areas Kwando, Kwara and Selinda Game Reserves. 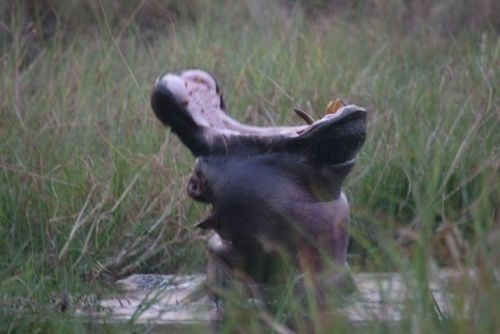 Selinda Reserve straddles both the Okavango Delta in the west and the Linyanti waterways and savannah in the east. The Selinda Reserve follows the course of the Selinda Spillway as it connects the Okavango to the Linyanti/Kwando River systems. The Selinda Spillway is like no other. It is a river that can flow in both ways, depending on where the water levels are the highest, the Linyanti waterways or the Okavango Delta. Also worth visiting in this region is Tsodilo Hills. With one of the highest concentrations of rock art in the world, Tsodilo has been called the ‘Louvre of the Desert’. Over 4 500 paintings are preserved in an area of just 10km2; not surprisingly, this area has been declared a World Heritage Site. Most of these paintings were done by the San people of the Kalahari (the Bushmen) who believe the hills to be a resting place for the spirits of the deceased, as well as the site of first creation. The exact age of the paintings is not known although some are thought to be more than 20 000 years old. The archaeological record of the area gives a chronological account of human activities and environmental changes over at least 100 000 years. The hills can be reached via a dirt road and are about 40km from Shakawe. Note, this road features loose sand in the dry season and lots of mud in the wet season. Local communities revere Tsodilo as a place of worship and as a home for their ancestral spirits so most local visitors here arrive for religious reasons. As its name would suggest, this venue is all about crocodiles, some 10 000 of them at any one time. Located some ten kilometres from Shakawe, close to the Okavango river, this is a great place to learn all about crocs and observe them up close. There’s also a curio shop and boutique where you can buy items made from crocodile hide. Hambukushu Baskets in Maun is owned by renowned basket weaver Thitaku Kushonya. The weavers here are mainly women, younger girls learn these skills through observation and apprenticeship. Visitors to the workshops can watch the women weave and even enjoy some lessons on this craft. A basket is a great gift to take home. Located in Maun, this community-based museum is focused on the culture and natural history of the Okavango Delta. Exhibitions include historical crafts, fine art, Bayei fishing net, photography, basket-weaving, art and written poetry. Here, you’ll also find the Bailey Arts Centre where local artists produce and sell baskets, screen prints, paintings, pottery and more. An admission fee is payable. Available in hotel, lodges, guests houses, B&B, Backpackers hostels and camping sites. (Jun-16). Doctor's contact added is for Dr Carey, Christopher Angus in Maun, a general practitioner. (Jun-16). There is a pharmacy at the Maun General Hospital and in town. There is a clinic and pharmacies around Maun. (Jun-16). There is a Shoprite in Maun.There are restaurant around Maun town to enjoy meals. (Jun-16). Note that low sulphur diesel is not usually available. (Feb-2015). Visitors reportedly paid for fuel at the Engen in Maun with a credit card without any problems. (Jun-16). You will find an internet café and free WIFI at Wimpy and Barcelos. (Jun-16). Phone Mac for Tow Ins and Repairs (Mechto Workshop) Office number (office hours only) +267 68 61 875 Riley's Garage also offers tow-in services. You can contact them on +267 686 0203. (Jun-16).